That demand is spat by police into the face of thousands of people every day in this country, many – perhaps most -- of whom have neither been caught in a criminal act nor have been named on an arrest warrant. The refrain is recited by home invaders in paramilitary garb after they have kicked in a door, usually as a follow-up to an attack with a flash-bang grenade. It is often performed as a prelude to Taser strikes, baton blows, or other punitive violence used against people who refuse to render immediate and unqualified obedience. Once the victim is forced to the ground, the familiar liturgy continues as the assailants chant “Stop resisting! Stop resisting!” in counterpoint to punches, kicks, and other varieties of state-licensed criminal violence. This exercise, we are told, is carried out in the service of that most important of all considerations, “Officer Safety.” It is true that the use of such methods is of great practical value to the privileged aggressors in government-issued attire. 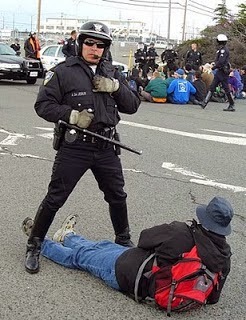 However, there is a sacramental function being performed here, as well: When a police officer – a carnal emissary of the divine state, an accredited member of its punitive priesthood -- orders a citizen to prostrate himself, he is, quite literally, demanding worship. For both Christian and Jewish believers, this act was appropriate only when directed at God. This is why three refractory Hebrew youths in Babylonian captivity refused King Nebuchadnezzar’s command that they “fall to the ground” as an act of worship before an idol of the king’s construction, even when death was prescribed as punishment for this act of resistance (Daniel 3:6). Prostration in prayer and worship is widely practiced in many faith traditions today – both Catholic and Protestant Christianity, in addition to Judaism and Islam. For believers, this is done as a display of complete submission and unqualified surrender to the only Being who has the right to require it from us. Most people of faith believe that refusal to render such worship is a matter for God to deal with in His good time. This isn’t true for the State’s armed emissaries, who respond to such impiety in much the same way that Nebuchadnezzar did: Refusal to prostrate one’s self at the command of a government functionary is cause for summary punishment, often of the lethal variety. Until the late 1980s, it was unusual for police to require such worship from citizens. The 1991 Report of the Independent Commission on the Los Angeles Police Department describes how elements of the LAPD had made it a common practice to order black and Hispanic men to “prone out” during ordinary traffic stops and similar encounters. This is why such people must be ordered to prostrate themselves before the Holy State and its anointed representatives – and then beaten into submission and caged if they resist. With evangelistic zeal, police have spread this gospel at gunpoint from inner-city neighborhoods in Los Angeles to the farthest reaches of rural and suburban America. Recently in the town of Moore, Oklahoma, five of the State’s purveyors of sacred violence ministered so vigorously to a middle-aged man named Luis Rodriguez that he was relieved of this life’s sorry burdens. Rodriguez had tried to intercede during a quarrel between his wife and daughter. This was brought to the attention of several police officers who were providing “Security” at the theater. When one of the strangers butted into the affair, Rodriguez politely explained that it was a family matter and ordered the intruder to mind his own business. Rather than obeying that lawful order, the officer – aided by three and eventually four of his comrades – escalated the affair, demanding identification, attempting to shackle and detain the innocent man, and finally taking him to the ground and killing him, most likely through prolonged positional asphyxia. Rodriguez was never suspected or accused of a crime. He was killed – in a fashion deemed “appropriate” by the local police chief – because he dared to withhold the act of worship-through-submission demanded of him. Police command, and expect us to obey, on the assumption that what liberties we enjoy are theirs to dispense, or dispense with, at whim – and that permitting defiance of “lawful” commands would cause society to unravel. There is only One before whom I will ever kneel. Others might eventually succeed in forcing me to the ground, but I’ll never prostrate myself before them of my volition. We would be really grateful for any help you can provide to keep Pro Libertate on-line. Thank you, and God bless! You are so amazing at documenting the police state! I really wish someone with big money would get behind you and fund YouTube channels for you, podcasts, and of course your usual blogs and tweets and FB posts. I would love to see you get the recognition and audience deserving of your hard work and abilities! I've enjoyed your work for some time now. As a public minister, I expereience my fair share of police encounters, and its interesting how often the issue of 'officer safety' comes up. It seems reasonable to somebody that a man with a Bible and a sign is a physical threat to a group of armed men wearing body armor. Though we have avoided arrest so far (19 years and counting), I am very familiar with the police mindset that they are the dispensers of our liberties.Keep up the good work. Please add Bitcoin to your donations page and I will send you a donation. Truly sad and pathetic. If you choose not to obey a cop that's your business, I can only assume you have had many run ins with them. Steveo - read that same passage in the orginal King James, or Tyndale Bible. A careful reading will reveal an entirely different meaning than that now presented in the "new" corrupted versions so beloved of the state, and state sanctioned monopolies ie copyright holders. and - it is actions that give meaning to words. Compare Paul's (and others) actions regarding government to the (purported) recent translations - a different picture emerges. I confess an inability to locate a passage in which Paul submits to government. Throughout the Bible there is open resistance to earthly government, except when the Hebrews demanded a king. Steveo: Pastor Chuck Baldwin wrote a whole book on this very question. He doesn't go with the current popular interpretation. I've never thought about this aspect of State violence. I think I agree with you, and with an additional point: these are humans doing this, and in their training, they are being conditioned to overcome resistance that you or I may provide, at all costs, with all the resources that they have available. They are being given life-and-death orders by their superiors and will unflinchingly do as told. Sometimes these orders are given "last week" during training and they are applied today as they storm your house (or approach your car). For most things, we can let the judge sort it out later. But when someone dies, it changes the appeal process permanently and irrevocably. You folks have the hope of resurrection, although I have not received that gift of faith. I believe we do share a love of liberty and a love of neighbor. Yet we both are offended by state sanctioned violence, such as this. Both you, and I, will not allow worship to be given to these people nor their 'bosses', but probably for different reasons. Yet 'the enemy of my enemy is my friend', which means that if you Christians hate this as much as I do, perhaps we have some common ground with which to go forward, hoping for not only freedom in our time, but peace as well. Check out lewrockwell.com. A number of knowledgeable authors (Lawrence Vance is really good)have taken Romans 13 to task, and have utterly debunked the crawl-on-your-submissive-belly-to-jackbooted-thugs nonsense. Steveo Van Damm, in our Constitutional Republic the people are the ultimate governing authorities. Unfortunately, a lot of conservative Christians use Romans 13 as an excuse to worship the military and police! Yes, please read Laurence Vance. While your determination to never kneel before anyone is admirable, will your wife & children be happy with that decision if it costs you your life? Just wondering if that fight would be worth it if your wife & children were to become known as the "Widow Grigg and her orphans" as a result. Thank you so much for all the work you do. I enjoy reading your articles and recommend them frequently. G-d bless! Consider the time in history and you will find the "resistance" you describe is taken beyond historical contexts. The Vespasian emperors used the the middle east as a source of free labor, I.e. slavery. Paul's protest was against the theocracy established by the Roman puppet Jewish leaders.Historical context MUST be considered if one is to understand Paul's motives. Might I suggest reading his entire account? WOW! Is that ever a malignant spit of venom!! My apology to 'anonymous' at March 11, 2014 at 7:54 PM. I meant my response to be to: anonymous at March 12, 2014 at 8:33 AM whose post confirms the absolutely unnecessary reality we are hesitant to admit, even in the face of it. This is just more evidence as to why we need to restore the common law Grand Juries back to the people, and to return America back to something that our Founding Fathers might actually recognize. Visit NationalLibertyAlliance.org and scroll down to watch the video. If you agree, register as a volunteer jurist. This is stupid. Ive been a criminal justice student for 3 years and they teach us to have the suspect in certain positions so we can secure weapons and take them into custody. Its for their safety and ours. They dont teach us to make them worship us at all. Its simple standard protocol. "they teach us to have the suspect in certain positions so we can secure weapons and take them into custody. Its for their safety and ours." 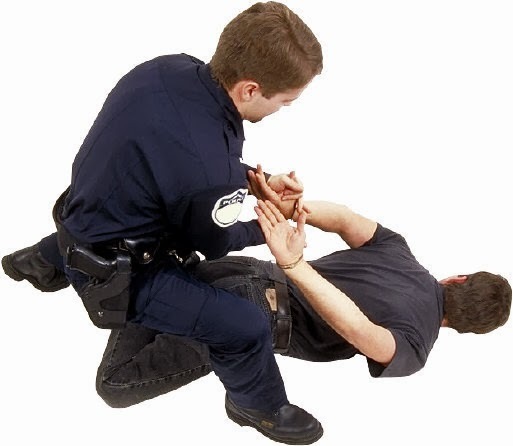 During an arrest, being tackled-to-the-ground instead of being asked to put your hands behind your back doesn't enhance the suspect's safety. Having one's face shoved against concrete doesn't enhance the suspect's safety. Having one's lungs crushed from being prone with the weight of one of more cops on one's back doesn't enhance the suspect's safety. As it says in Acts 4:19 when the apostles responded to those who arrested them. "Peter and John answered, “Do you think God wants us to obey you or to obey him?" In my opinion only righteous laws are to be obeyed, when they go against the principles of scripture they are to be disobeyed. Unfortunately many of our laws today go against the teaching of scripture. Freedom and liberty are biblical concepts that seem to be forgotten these days and are violated constantly. "This is stupid. Ive been a criminal justice student for 3 years and they teach us..."
Do "they" teach you right from wrong? Do they teach you that you have the duty to disobey illegal orders? Do they teach you to respect the rights and lives and safety of citizens? And the bottom line question: Do you have the ability to think for yourself in deciding if what they teach is right or wrong, or do you just blindly accept what they say as truth and obey without question? Methinks the latter. Steveo Van Damm, in our Constitutional Republic the people are the ultimate governing authorities." Not true at all. In our Constitutional Republic the Constitution is the ultimate governing authority. As a former Criminal Justice grad who also happens to be a Christian, I am appalled at the militant actions of some of our police departments. They violate not only our Constitutional rights, but our human rights, as well. For choosing to pray in my own yard, I was harassed by local police, deemed psychotic by an ignorant cop, abducted beyond reasonable force and injured, stripped in front of police, drugged with haloperidol (a drug for schizophrenics)at the ER, which had on file every blood pressure and arthritis prescription I take, since I had recently received hip replacement surgery at their facility. After eight hours, they strapped me to a gurney and took me to a psych facility and held me against my will for 72 hours. I cooperated out of sheer fear. The psychiatrist there, of eastern descent, felt I should be put on psychotropic drugs because I spoke of my belief in God. To make matters worse, since I am a woman of low means, I cannot get legal assistance on a contingency basis even though I've been told I definitely have a case. It is pretty obvious to me the end of the age is upon us. May God have mercy on those who choose not to believe in him. Amazing analysis and a deft wit as usual, Mr. Grigg. If I were inclined to prostrate myself before other mortals I'd e-prostrate myself before your wielding of the word. I'd like to comment a bit on 'prostration' if you don't mind. In the Hindu religion, it's quite a common practice to prostrate oneself in front of God... AND certain other humans. For example, there is a common quasi-religious saying that explains the 'hierarchy of Holiness' (that's the closest translation I can provide) which states: "Matha, Pitha, Guru, Dheva" (Mother, Father, Teacher, God). Hinduism can be considered a version of Henotheism (One God but worshiped in many forms) and thus God presents Himself not just in his transcendental forms or avatars but can also be recognised in everyday forms. Such as respecting your Mother, Father and Teacher and ofcourse ultimately God. Loosely put, it means "respect your Mother, Father and your Teacher as you respect God." It doesn't mean you worship your parents or your teacher; however you do seek their blessings to help guide you through life. And the way you seek their blessings is by prostrating yourself at their feet - especially at religious ceremonies or auspicious occasions (weddings for example). Another great write up as usual Mr. Grigg! Looking forward to more! I find it a very informative speech and quite relavent to today. May our oppressors finally turn on each other and destroy themselves.